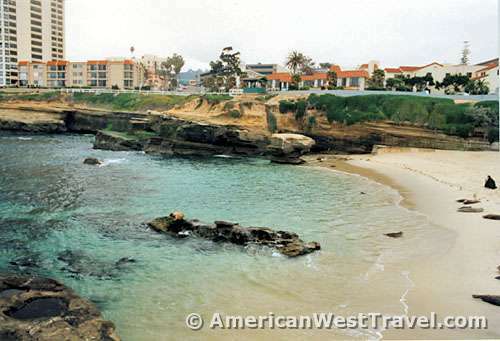 The community of La Jolla, often called the "Beverly Hills of San Diego", is renowned for its posh resorts, upscale shops and galleries, and fine restaurants. Actually within the city limits of San Diego, La Jolla also features a spectacular coastline with excellent opportunities for sightseeing and recreation. Scripps Park sits on a promontory near the center of town, where the north-south coast takes a sharp turn east forming La Jolla Cove. This sheltered inlet features extremely clear water and very little surf, making it ideal for swimming and diving. The Cove has a tiny beach at the base of sheer cliffs, accessible by a steep set of stairs from the edge of the park. Scripps Park itself features grassy knolls for picnicking and relaxation as well as stunning views in every direction. Walking paths parallel the cliffs. 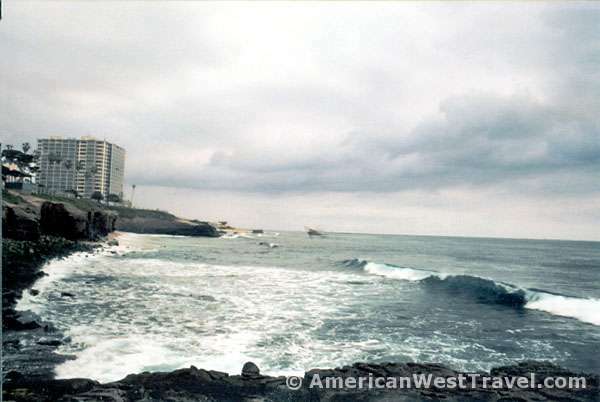 The park's west side faces the open ocean where the surf pounds the rocks below. You may walk out on the rocks at the edge of the promontory for a more exciting view. Following the walking path south a short distance, note the small rocky islets a short distance offshore. 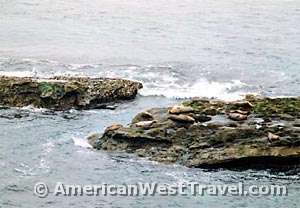 You will almost always observe harbor seals or sea lions here. Continue a little farther, and you come to Children's Beach, a tiny crescent of a beach sheltered by a breakwater. The beach was originally intended for children but was ultimately taken over by seals. Humans and seals now peaceably share the space. Swimming (by people) is prohibited here, and it is illegal to harass any marine mammals. However it's an excellent opportunity to observe and photograph wildlife up close. Harbor seals and sea lions are easy to distinguish. The less common sea lion weighs several hundred pounds and has a prominent flipper, permitting manual dexterity. Performing "seals" at water shows are always actually sea lions. Sea lions generally prefer to congregate on offshore rocks, like to play, and have a bark quite like a dog's. Harbor seals weigh about a hundred pounds and don't have a large flipper. Hence they can only waddle when out of the water. They generally prefer to snooze on sandy beaches. Less than a mile farther south lies Marine Street Beach and beyond, Windandsurf Beach. Among the most scenic beaches in southern California, they face the open sea and experience extremely heavy wave action, making them favorites for surfing. The beaches are also excellent for walking. Continuing east around La Jolla Cove, there is a unique opportunity to visit the Sunny Jim Cave. Sunny Jim is one of the seven La Jolla Caves, fissures carved into the sandstone cliffs by eons of wave erosion. For a small fee, you descend 144 steps through a tunnel behind the Cave Shop (1325 Cave Street, off of Coast Boulevard). The caves also feature fascinating tidal pools, easily observed at low tide. The other La Jolla Caves are difficult to access by foot except during periods of extremely low tides. Hence they are a popular destination for kayakers. For a broad, flat expanse of sandy beach, head north out of town on Torrey Pines Road to La Jolla Shores. 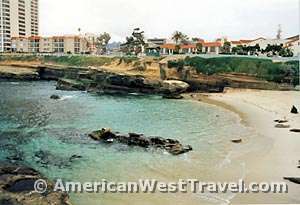 With a beautiful backdrop of world-class resorts and distant cliffs, La Jolla Shores is excellent for a leisurely day at the beach. Offering a playground, boardwalk, bathroom, and showers, the beach is highly popular during the summer. Parking is limited so plan to arrive very early or late in the day. Continue north on Torrey Pines Road to the Birch Aquarium on Expedition Way. The aquarium is the interpretive arm of the Scripps Institution of Oceanography, one of the world's leading oceanographic research and exploration institutes. On a highly scenic hillside, the aquarium focuses on the marine life of the Pacific from the cold northern waters to the tropics. An artificial tidal pool is featured on the outdoor central plaza with a beautiful scenic backdrop. From December through March, Birch focuses on the annual gray whale migration, with daily whale-watching cruises. Our final stop is at Torrey Pines State Park, farther north on Torrey Pines Road near the town of Del Mar. 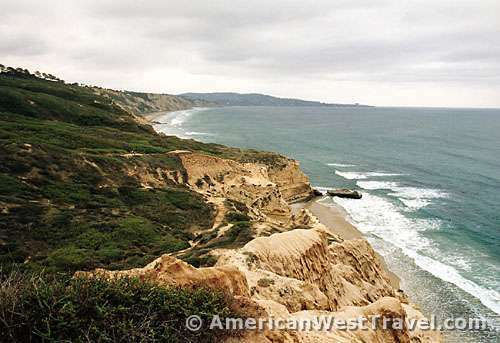 A long bluff backs a highly scenic beach with sheer cliffs nearly three hundred feet high. You may hike along the beach or drive to the top of the bluff where a visitor center and miles of trails await. Most of the trails lead to spectacular panoramic views at the edge of the bluff. Others extend down to the beach. The top of the bluff is a world of wildflowers and lush greenery including the very rare Torrey Pine. The park is one of southern California's premier locales, offering a nice rustic feeling away from the urban area. For more information, including detailed travel directions, you may visit the San Diego Convention and Visitors Bureau. Or, call the Bureau at (619) 236-1212. 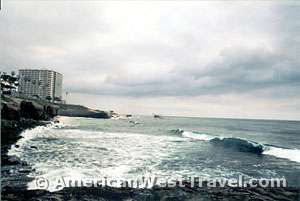 The seaside resort of La Jolla is north of downtown San Diego.